PlayVox is a top-quality monitoring software for live chat, email and phone, which helps businesses analyze how the customer support staff interacts with actual customers. 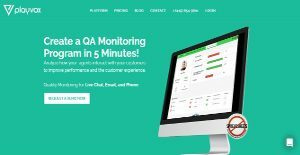 It aims to enhance performance and customer experience, and claims to help create a QA monitoring program in just five minutes. Customer interactions can be analyzed in all channels for a robust evaluation of coaching and motivation. At the same time, PlayVox also helps businesses train their customer support staff for better performance and improved customer experience. The software eliminates the old-school method of using spreadsheets for quality assurance and claims that it’s possible to run a call center operation without multiple platforms and software, and complex downloads and installations. That’s the simplifying power of PlayVox: it takes a unified and holistic approach towards managing a call center workforce, and it combines best-of-a-kind features into all-in-one solutions to scale quality monitoring programs. Measurement and evaluation are the first steps involved in improving any process, and this software allows evaluating agent-to-customer interactions across all channels, including live chat, calls, email and social media. Content can be distributed in minutes for enhanced learning, while quizzes and courses can also easily be created to keep the support staff up to date. The performance of agents and team leaders can be viewed at a single place, thanks to the easy-to-use interface, allowing management to see how the team is performing. It also allows sending digital gift cards in recognition of employee accomplishments to keep the teams motivated and supports over 240 big names, including Amazon, Nike and Starbucks. To keep the employee morale boosted and transform them into an engaged community, PlayVox allows sharing accomplishments using badges and karma points. Collection and analysis of employee surveys have been made easier, which allows management to review and gain thoughtful insight at a glance. It provides a single hub to analyze performance, coaching, training, quality, employee engagement and most importantly customer experience. The Team Communications features allow support staff and team leaders to connect, engage and work more efficiently across the organization for a better customer experience. Operational excellence, consistency, better service and customer loyalty remain the four basic pillars of the software, which is trusted by industry giants including Google and Microsoft XBOX ONE. It also comes with connectors for major software like Salesforce, Zendesk and Five9. Since each company has specific business requirements, it is sensible for them to abstain from seeking a one-size-fits-all faultless software application. Needless to say, it would be pointless to try to find such a platform even among market-leading software applications. The smart thing to do would be to catalog the various important elements that require consideration such as key features, budget, skill levels of workers, company size etc. Then, you should do your groundwork thoroughly. Read some PlayVox reviews and check out each of the other solutions in your shortlist in detail. Such in-depth research can make certain you weed out ill-fitting platforms and choose the app that provides all the aspects you require for business success. How Much Does PlayVox Cost? We realize that when you make a decision to buy Customer Support Software it’s important not only to see how experts evaluate it in their reviews, but also to find out if the real people and companies that buy it are actually satisfied with the product. That’s why we’ve created our behavior-based Customer Satisfaction Algorithm™ that gathers customer reviews, comments and PlayVox reviews across a wide range of social media sites. The data is then presented in an easy to digest form showing how many people had positive and negative experience with PlayVox. With that information at hand you should be equipped to make an informed buying decision that you won’t regret. What are PlayVox pricing details? What integrations are available for PlayVox?